Acro-Tin is a pure tinning powder that can be used for tinning bearings, radiator connections and auto bodies. To tin surface, remove paint, oil and excessive rust. Heat surface to degree necessary to melt solder. Apply with steel wool or wire brush. To make paste, add water to desired consistency. To tin welds, mix with HC1 in glass container and apply while weld is still hot. Residue may be removed immediately after soldering with a damp cloth. Warning: Corrosive-causes burns. Do not get in eyes, on skin or clothing. 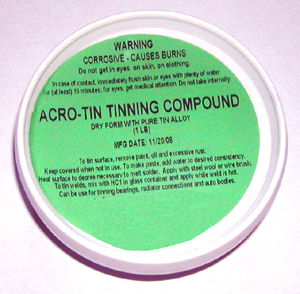 Acro Soder Tinning Paste is considered a Hazardous Material. Appropriate UPS/ FedEx Special Handling Hazardous Fees will apply on the shipment. It is best to order the largest quantity desired to offset the per shipment Hazardous Fee.